Why should you buy the Sirena? Here are six easy answers. Healthy. Never buy a bag or filter again—both recognized as germ/bacteria hotbeds. Natural. Bags are man-made and manufactured, but water? Water isn't. Purified. Bags and filters pollute indoor air. Sirena water-washes your air, returning it fresh. Powerful. Powered by Amatek—the strongest motor in the vacuum industry. Efficient. Sirena cleans with 100% efficiency, whereas bags and filters lose efficiency over time. Easy. Bags and filters are messy, smelly, hard to find, and expensive. Water isn't. 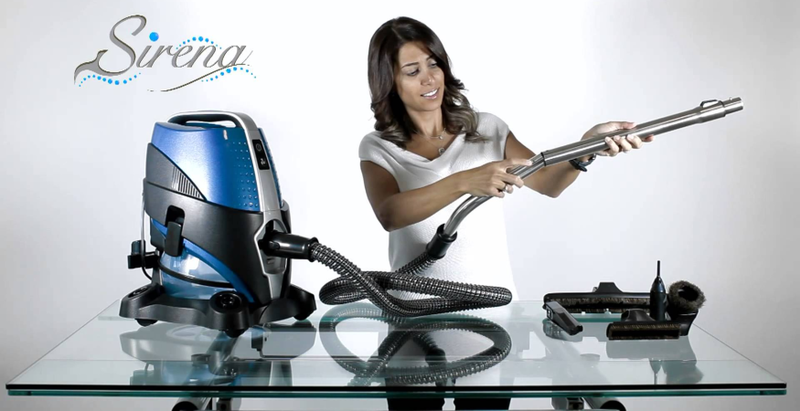 The water-based filtration system makes Sirena a fundamentally superior total home cleaning system. This allows it to clean your home in ways your traditional vacuum simply just can't. This is because of the inefficiency of bag/filter-based vacuums. When dirt and dust pass through a bag or a filter, it clogs the pores that allow air to flow through them. This clogged airflow means less cleaning ability, and the efficiency of such devices drops drastically over use. Without good airflow, the usefulness of your machine dwindles downward. Filters have to be replaced regularly; every time you open the vacuum to deal with the bag or filter, germs, bacteria, and dust can leak back into the air you breathe. They thrive in dark, warm, filthy places, and when they contaminate the air, they get into your lungs. This is particularly dangerous over time to sufferers of breathing disorders, asthma, and allergies. A high-definition look at the Sirena, straight from Sirena Inc.
From the beginning, Sirena was designed to work in tandem with nature. The system utilizes a unique method to clean with the power of the most bountiful element of life—simple, life-granting water. The element of working with Mother Nature, and not against, is a recurring element in the design of the Sirena. Furthermore, the carbon footprint of the machine is offset by its lack of disposable bags/filters, and as opposed to the contaminants released into the air by dealing with the removal, cleaning, and maintenance of these articles, the fact is that the water actually washes the air as it cleans. • Quiet Mode to remove odors and dust from your home. • Specialized Fragrances to transform the machine into an air freshener. • Ocean Breeze Deodorizer to sanitize germs and bacteria. • Eucalyptus Oil to transform your Sirena into a vaporizer. The real thrill of the Sirena total home cleaning system is what's behind it. Sirena is the combination of modern design and engineering, based upon years of experience in the vacuum industry. High quality, affordable, and water-based, the Sirena system is healthy, natural, and cleans with 100% efficiency. The water-based filtration system removes the need to ever replace a bag or filter again, cutting down on costs and on refuse. A glance at the painless, clean maintenance of the S10NA. See the features of the S10NA under greater detail. Watch the S10NA work its magic. Motor: The Sirena Vacuum uses an Italian motor made by Amatek. This is the strongest motor available for a vacuum cleaner with over 86 inches of water lift. This two-speed motor even has a quiet mode. The maintenance-free motor requires no service and has a ten year warranty. .
Hoses: The Sirena Vacuum comes with two hoses. One is designed to be used for picking up water, which lets the Sirena vacuum be used as a wet dry vacuum. The main hose has over a 77 inch reach and has the vacuum controls in the handle. The specially designed handle allows you to vacuum without any stress on your hand and wrist. Wands: Your Sirena Vacuum comes with two sets of steel wands. When you add these to the long hose, you can reach up to 12 feet for those hard to reach jobs. 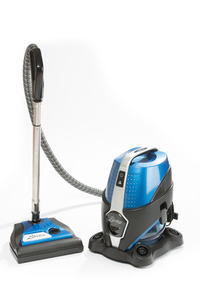 Motorized Brush Unit: The power nozzle on the Sirena Vacuum is a totally new design. With its low profile, it goes under most of your furniture for extra deep cleaning. The vacuum belt requires no tools to change and an extra belt stores on the bottom of the nozzle. The hardwood roller is designed with many of today's newer carpets in mind. The nozzle also has three height adjustments so you are always vacuuming at the right height. Cleaning Tools: Five special attachments ride along on the vacuum for your cleaning convenience. Each tool was redesigned to give the maximum airflow for the deepest cleaning. All of the attachments use natural brushes and are designed not to get pet hair clogged in the tools. The tools all have a locking button to prevent the tools from falling off. There is also a tool for inflating air mattresses and inflatable toys. Dolly: The Sirena Vacuum sits on a removable dolly with four casters. These casters allow the vacuum to move along on the floor and prevent the vacuum from falling over. The caddy comes off when you do not want it to roll around, such as when you set it on steps. Air Cleaner: Your Sirena vacuum also can be used as an air cleaner. When you put one of the many fragrances available in the water, you freshen the air as you clean it. Running the vacuum once a day for a few minutes helps keep down indoor pollution. When you add Eucalyptus Oil to the water, you can use the vacuum as a vaporizer. Hepa Filter: The Hepa filter is washable and never has to be changed. You do not need any tools to wash the filter. 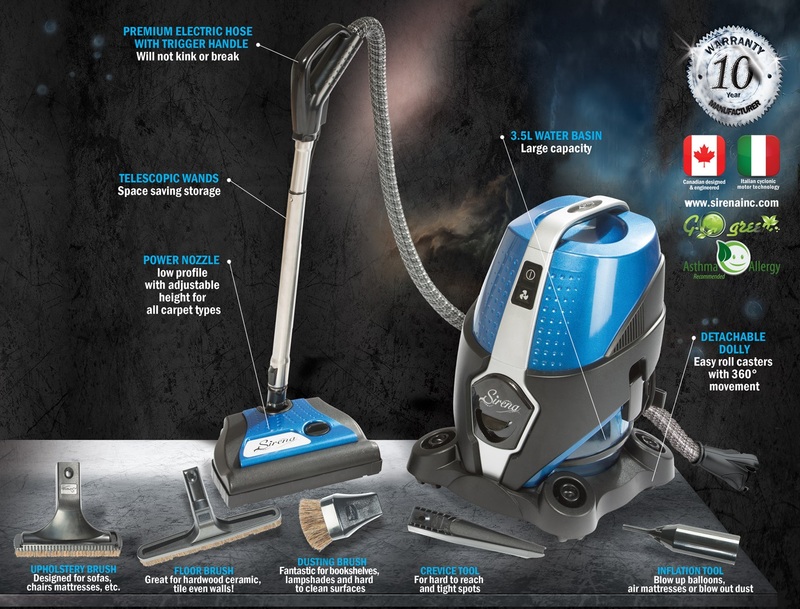 Extra Deep Cleaning: The Sirena Vacuum is also very good at eliminating dust mites (dust mites are so small that 7,000 can fit on your finger tip), embedded carpet dirt, pet fur/dander, household odors, ragweed and smoke. Warranty: The warranty is 10 years on the motor. 3 years on all other parts, and one year on labor. All of these features are designed to save you money (no bags to buy) and have the healthiest, clean home. Net Weight:13.23 kg / 43 lbs. Shipping Weight: 18.34 kg / 47 lbs.